For the first time in weeks, Matt and I are sitting quietly at home on a Saturday enjoying lunch together. I love these days, when our pace slows down and the stress melts away and we can sit cross-legged on the living room floor and happily eat our midday meal. 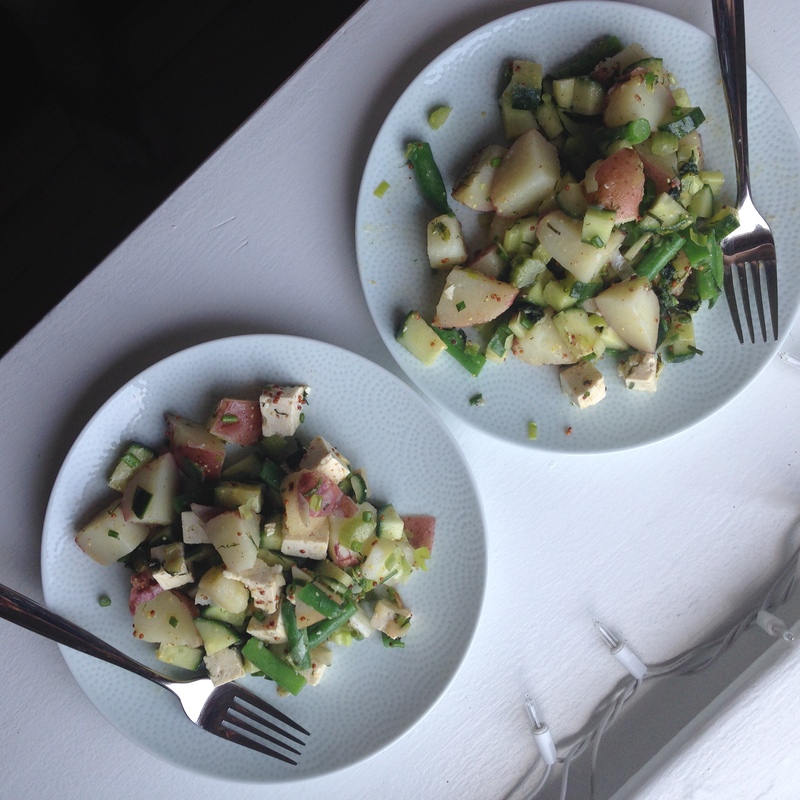 Today we ate potato salad, full of crunchy fresh vegetables and tossed with a mustard vinaigrette. Growing up, we ate a lot of potatoes – mashed with extra butter and chicken broth, cut paper thin and doused with Lawry’s seasoning before being oven-fried, or roasted in a cast iron skillet with olive oil and a healthy serving of salt. But everyone’s favorite potato dish was only served once a year at Chanukah time, when mom put me to work peeling potatoes over the kitchen sink. It took me over an hour, peeling potato after potato and watching the skins fall away in a long spiral into the stainless steel basin. One year, I neglected to run the disposal between potato peelings and when I finally tried to flip the switch the sink filled with murky brown and starchy water that refused to drain. Mom spent the rest of the evening plunging and fiddling under the sink. The disposal motor never worked well again. But it was worth these trials to get to the end result, golden brown and crisply fried potato latkes, salty, hot, and dangerously addictive. Whenever my mom’s dad visited, he always requested her latkes. He called them potato pancakes because he could never quite wrap his head around the Jewish words and traditions that his daughter adopted. But he loved latkes and would have been perfectly content eating nothing but latkes for the duration of his visit. My dad’s dad also loved potatoes. In fact, he practically demanded them at every meal. He didn’t like pasta and he hated rice, thanks to a stint in the Pacific during World War II, when rice was almost all he ate. When my dad’s parents stayed with us for extended periods of time, I started to fantasize about risotto and pasta with pesto, while I forced myself to eat another side of steamed new potatoes with butter and chives. It had been a while since I had made potatoes, a fact completely unrelated to my childhood overdose, but this lazy, late summer day seemed to call for a large bowl of humble potato salad. My mother makes an excellent potato salad. She slices the still hot potatoes and immediately douses them in a balsamic vinaigrette, letting them marinate and absorb the flavor before adding carrots and celery and a dollop of mayonnaise. Today I strayed from the traditional and made something a little fancy, a potato salad more in keeping with something my dad would have made, filled with golden fried leeks and cubed tofu. It was delicious. We had seconds. And now we are perfectly fueled for a leisurely walk through our neighborhood in the breezy August heat. Thank you Saturday. I am content. Bring a pot of water to a rolling boil. Salt generously, add the potatoes, and cook until tender but not falling apart, about 10 minutes. Thirty seconds before the potatoes are done cooking, add the green beans to the pot. Drain the potatoes and beans and set aside. In the meantime, make the dressing by whisking together the mustard, vinegar, 1 tablespoon olive oil, the sugar, and 1/4 teaspoon salt in a bowl. Alternatively, combine the ingredients in a mason jar and shake until blended. Taste and adjust if needed. In a large skillet, sauté the dill in a splash of olive oil over medium-high heat. Add a couple pinches of salt, stir in the leek, and sauté until golden and slightly crispy, 4 to 5 minutes. 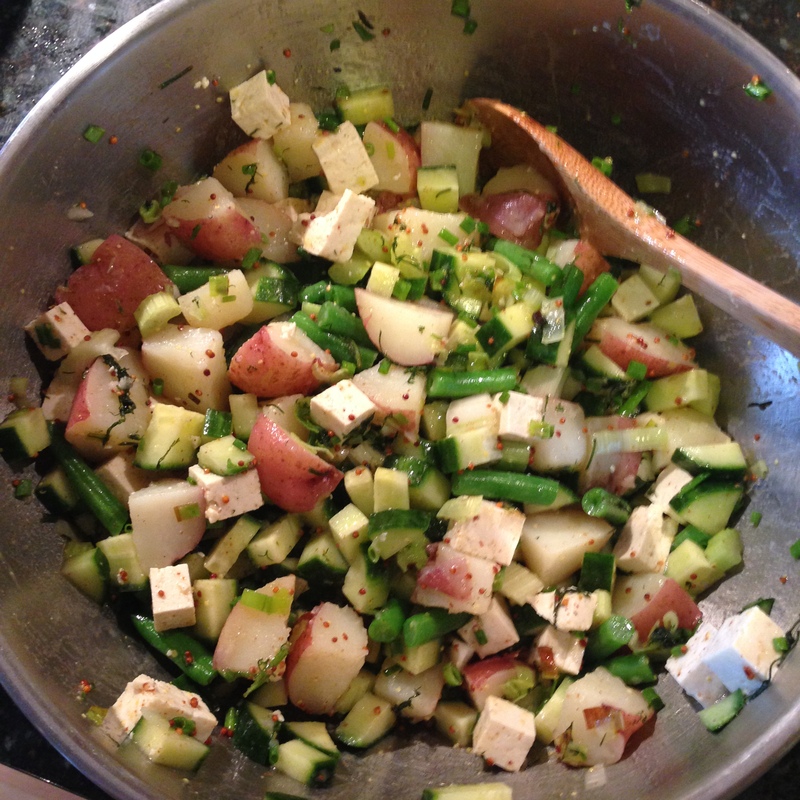 In a large bowl, gently toss the potatoes and green beans, celery, cucumber, tofu, chives, and half of the leek with most of the dressing. Taste, and add a sprinkling of salt, if needed. Turn out onto a platter and finish with a final drizzle of dressing and the remaining leek. Serve chilled or at room temperature. Tags: lunch, potatoes, salad, vegetarian | Permalink.